Appointed cadet United States Military Academy, 1 July 1837 and graduated nineteenth in a class of fifty. Brevet second lieutenant, First Artillery, 1 July 1841. Second lieutenant, 28 September 1841. First lieutenant, 3 March 1847. From 1846 to 1851 was on duty at the United States military academy, as assistant professor of mathematics and instructor of infantry and of artillery. Then having been promoted first lieutenant First artillery, he was on various duty, at New Orleans, at Fort McHenry, on the Texas frontier, etc., with promotion to captain in 1853, until November 1858, when he became assistant to the judge-advocate of the army. He remained in that position, at Washington, until April 1861, resigning when Virginia left the Union. Major, Corps of Artillery, C. S. A., May, 1861. Lieutenant colonel, and A. A. G., in military forces of Virginia, May, 1861. Chief of Artillery and Ordnance, in Army of Northern Virginia, May to July 22, 1861. Colonel, P. A. C. S., June, 1861. Brigadier general, P. A. C. S., 21 July 1861. Major general, P. A. C. S., 10 May 1862. Brigade, Ä, 1861, composed of the Seventh, Eighth, Ninth and Eleventh Georgia and First Kentucky Regiments Infantry, and Alburti's Battery of Virginia Light Artillery. Assigned to the command of the Army of Pensacola, Florida, 27 January 1862. Commanding Department of Alabama and West Florida, 1862. 29 April 1862, commanding division, Army of the West. 2 June 1862, commanding Second Division, Army of the Mississippi. Commanding base of operations of General Bragg's army, August to 22 September 1862. Assigned to command of Department of East Tennessee, 23 September 1862. In command of the Trans-Alleghany or Western Department of Virginia, from 4 December 1862 until 4 March 1864. In command of the Department of South Carolina, Georgia and Florida, from 16 April until October, 1864. Commanding District of South Carolina, from October 1864 until January 1865. Commanding Department of Florida and South Georgia, from 12 January until 10 May 1865. On entering the Confederate service he was commissioned major, corps of artillery, C. S. A., and with promotion to lieutenant-colonel, was appointed assistant adjutant general of the Virginia forces. During the organization of Beauregard's army and the battle of First Manassas, he served as chief of artillery and ordnance, and his services were gratefully acknowledged by the general commanding. Promotion to colonel was accorded him during this service, and he was promoted brigadier-general to date from the day of victory. He was on duty in the Potomac district, in command of a brigade of Georgia regiments subsequently under George T. Anderson, until January, 1862, when he was put in command of the army of Pensacola, relieving General Bragg. On 3rd March, he assumed command of the department of Alabama and West Florida, with headquarters at Mobile. In April, being promoted brigadier general, he was assigned to command of a division of the army at Corinth under General Van Dorn, including the brigades of Rust, Maury and Roane, and in June he was put in command of Hindman's division. Later he was in charge at Chattanooga, and in September was stationed at Knoxville in command of the department of East Tennessee. 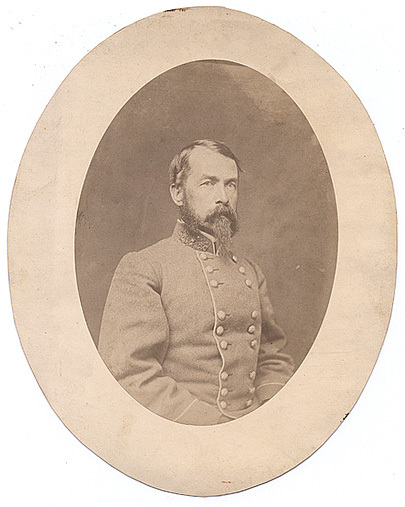 From 4 December 1862 until 4 March 1864, he commanded the department of Western Virginia, with headquarters at Dublin, Va., and in general charge of the operations in defense of the Virginia & Tennessee railroad and the salt mines. Subsequently he was in command of the department of South Carolina, Georgia and Florida until succeeded by General Hardee in October. During this period Charleston harbor was defended, and the Federal expedition in Florida was defeated at Olustee. He commanded the district of South Carolina until January, 1865, and the department of South Georgia and Florida until 10 May 1865, when he surrendered at Tallahassee. Then retiring to private life he was engaged in farming, with his residence at Mattoax, Va., from 1866 until 1880, when he was appointed to a position in the office of the adjutant-general at Washington. In 1885. he was transferred to the office of the judge advocate general.